I have made this similar recipe that I found at Whole Foods for Green Curry Chicken, and check it out! They have my picture up on their web site! (Just click on the link to see under customer photos.) This time, I wanted to try the red curry paste instead of the green curry paste to see the difference. In a direct label to label comparison, the only difference was that one is made with green chili peppers, and the other is made with red chili peppers. I also decided to use coconut water instead of coconut milk. This eliminates all fat from the contribution of coconut milk. A regular can has about 10 grams of fat, and the light version has a little bit less. You can find this zero fat coconut water in the organic section of Kroger Marketplace. So many great things come from that section! Don't confuse it with coconut juice. That stuff has unnecessary added sugars. This stuff is naturally sweet enough, and comes packed with 650 mg of potassium! This recipe is so easy to make! You just start with a tiny amount of oil, add the red curry paste, then your meat and veggies, then the coconut water. 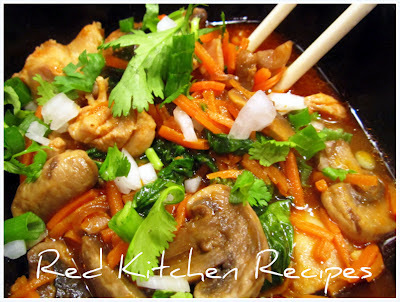 Simmer until cooked through, and serve with rice or noodles. This is a good way to cook up all those things in the fridge that you need to cook up! I had gone to Memphis over the weekend, came back, and said I better cook this stuff up before it goes bad! You can use any vegetable, and you can use any other protein. I developed this recipe based on what I had in the fridge! Add a thin amount of oil to lightly cover the bottom of a large pan. Heat over medium high heat, about 5 minutes. Add the chicken, and stir fry over medium high heat. Mix in carrots and mushrooms. Add the fish sauce. After about 5 minutes, add the coconut water. Simmer over medium low until everything is done, about another 5 minutes. Add spinach or arugula until wilted. Garnish with diced green and white onions and cilantro. Add basil if you have it...serve over rice or noodles.